The annual Nuclear Security Summit, aimed at reducing the world's nuclear weapons, gets underway Thursday in Washington with President Obama hosting a series of meetings with the leaders of several Asian nations to talk about efforts to prevent North Korea from becoming a bigger threat. But the gathering of more than 50 world leaders will focus primarily on keeping terrorists from obtaining the ingredients for a dirty bomb, a concern heightened by last week's terror attacks in Belgium. "Given the continued threat posed by organizations such as the terrorist group we call ISIL, or ISIS, we'll also join allies and partners in reviewing our counterterrorism efforts, to prevent the world's most dangerous networks from obtaining the world's most dangerous weapons," Obama wrote in a Washington Post op-ed.Obama's first meeting at the Walter E. Washington Convention Center will be with South Korean President Park Geun-Hye and Prime Minister Shinzo Abe of Japan. In the afternoon, he'll sit down separately with Chinese president Xi Jinping and French President Francois Hollande. Conspicuously absent will be Russian President Vladimir Putin, whose country holds massive stockpiles of nuclear material. Putin has said he doesn't want to be part of any talks led by the United States. Regardless, Obama said their two countries remain committed to completing an agreement to continue lowering their Cold War-era nuclear arsenals, which make up about 90 percent of the world's nuclear weapons. The summit's agenda will also include discussions on Friday among the six countries involved in a non-proliferation treaty with Iran: the United States, China, France, Russia, the United Kingdom, and Germany. All numbers are the maximum approximate estimates. 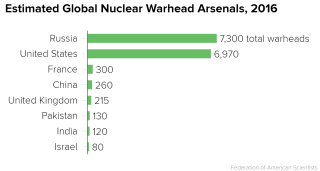 The exact number of nuclear weapons in each country is a national secret. Thus, estimates are based on historical records and occasional leaks.